Bethesda have begun a streaming series named TwitchWorks – and each week they’re planning to play through a chapter of Wolfenstein before bed, so that we can be lulled off to sleep by the Swedish tenors on the MachineGames team. The first chapter covers The New Order’s BioShocktastic tutorial level, and delves into top technical secrets, character development, and the establishment of Wolfenstein’s “larger than life” tone. The commentary begins at the hour mark. 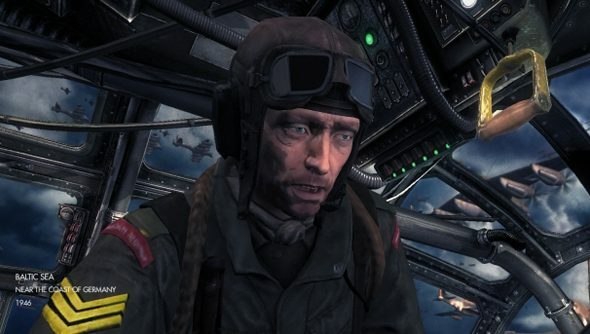 MachineGames creative director Jens Matthies and Wolfenstein exec producer Jerk Gustafsson tell us that for technical reasons, the fighter plane hurtling through the game’s opening sequence is actually static. Instead, everything around it is moving, and the designers had to create the impression of flight. The illusion lasts, even while B.J. Blazkowicz opens the side door of the plane to allow his pilot to hurl himself onto the wing of an adjacent, burning bomber. A bit later, the pair talk about the difficulty of introducing Private Wyatt offscreen. “In the story we set up Private Wyatt as a sort surrogate son and Fergus Reid as a father figure,” said Matthies. A relationship that’s established over the radio. Nice. Do you think you’ll be sat around the wireless to hear more next episode? Our Steve judged Wolfenstein: The New Order to be a “masterpiece of its genre”.